SAUSALITO, CA—Following nine months of surgeries and physical therapy to heal the aquatic animal’s debilitating injuries, officials from the Marine Mammal Center released a fully rehabilitated sea otter back into the food chain Tuesday. 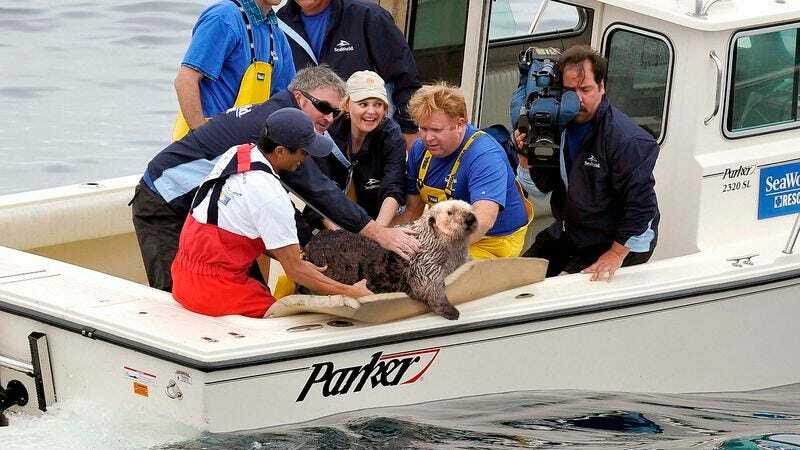 “After many tireless days and nights spent helping rebuild his strength, we’re excited to get this little guy back into a tiered ecological feeding structure,” said marine biologist Shannon Murphy, confirming that, at approximately 10 a.m., the otter was removed from its cage and carefully reintroduced into the hierarchy of predation. “It’s always sad to say goodbye to an animal we’ve spent so much time caring for, but that’s ultimately why we’re here—to give these creatures a second chance at briefly occupying a middle rung in a progression of consumption where they serve as a primary food source for a higher organism.” At press time, a crowd of onlookers was waving to the otter as it swam off into the migration routes of sea lions, orca whales, and several species of shark.